NEW YORK (CNNMoney.com) -- Nissan announced Tuesday that its Leaf electric car will come with a sticker price of $32,780. But after a federal tax credit of $7,500, the car will only set you back about $25,280. That would make the Leaf considerably less expensive than General Motors' Chevrolet Volt, which is expected to cost around $40,000, or about $32,500 after the federal tax credit. The Leaf expected to go on sale in December, one month after the Volt. By keeping the sticker price low, the Leaf will be profitable for Nissan, said Mark Perry, Nissan's director of product planning. That means customers should expect more variants of the Leaf in coming years, he added. Nissan has already said that there will be a luxury Infiniti version of the car. Industry analysts have frequently said that electric cars would not be profitable for years to come because of the high costs associated with the vehicles batteries. "We've been working in lithium ion batteries for 17 years," Perry said. "So all that advanced research and engineering work we've [already] paid for." The Leaf and Volt are not quite directly competitive, although both are electric cars. The Leaf is an all-electric car with an around-town driving range of about 100 miles. The Volt has a range of only 40 miles, enough for a typical days driving, but it also has a gasoline engine to generate electricity for further driving up to about 300 miles. Nissan had previously said that it expected to price the Leaf competitively to similar gasoline-powered cars such as a well-equipped Honda Civic. The Leaf's standard features will include navigation and Bluetooth telephone connectivity, said Perry. Nissan already has a list of more than 80,000 people who have expressed interest in the Leaf, Perry said. And in coming weeks, Nissan will begin taking refundable $99 deposits for the car. Those who submit deposits can have their homes inspected to make sure they have appropriate space and wiring to install a charging dock, Perry said. Nissan expects about half those expressing interest to submit a deposit, he said. Nissan also expects many customers to lease the car. That way, they won't have to worry about filing or refiling their taxes go get the benefit since it will factored into the lease payments, Perry noted. The car will lease for a $349 a month with an initial down payment $1,999. "Our goal there was to get our total operating cost, vehicle, electricity charging station, all in, around $400 a month," Perry said. In some states there are also state incentives for the purchase of an electric car. In California, for example, there is a $5,000 credit which would reduce the cost to just over $20,000, Perry said. 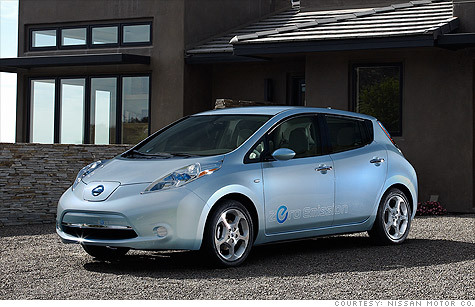 Nissan has partnered with an outside company, AeroVironment, to install home chargers for the car. Installation of the charger will typically cost $2,200, Perry said, but there is a tax credit that will cover half the cost up to $2,000.